Possibly encouraged to invade Spain in the first place by Hispano-Romans unhappy with the Vigigoths, the Moors came and stayed for around 700 years, leaving a definite imprint on the country, particularly Andalucia. The Moors came from north Africa, Muslims,a mixture of Arab and Berbers (the latter from the mountains of Morocco - tribes with their own language that few Arabs would understand). The name "Moors" comes from the name Mauretania, which at the time referred to the part of north Africa roughly now represented by Algeria and Morocco. This was a huge change for Spain - a new language, religion, culture and a new name, for the part of the country under Moorish control was known as Al Andalus. The Moors had a vicious way of dealing with enemies and made sure that people knew about it. As a result there was little resistance at first and they took over Toledo, the capital, within a year. Within a few years, they controlled most of Spain (excluding Asturias). Although the Moors fought in Asturias, the remaining fighting locals took to the hills and were left alone. Although the Moors may appear to have conquered most of Spain with relative ease, they by no means had an easy time of it over the years. The Moors however built splendid palaces, with much evidence remaining today, and their capital was Cordoba - thought to have been the most civilised city in Europe around the 10th century. The mosque at Cordoba became the second most important Muslim place of worship after Mecca, with a roof supported by 800 pillars of alternating red and white stone. The Moors further developed agriculture, and in particular, irrigation, by channeling water to where it was needed- many of these systems are still in use today. They also introduced citrus fruits, figs, pomegranates, sugar cane, cotton, silk and rice. However, the descendants of those early undefeated fighters in Asturias rallied support and pushed the Moors back over the centuries to eventually become known as the reconquest, recapturing Toledo in 1085. There was however also, much fighting between the Christian kingdoms, until the marriage of Isabel (heir to Castilla, which included most of Spain) and Fernando (heir to Aragon, which included Catalunya and Valencia). Castilla had been named after the number of castles that had been built for defense against the Moors. This union of the kingdoms by marriage strengthened the resolve against the Moors, who then controlling an area of Andalucia roughly equating to the provinces of Malaga, Granada, and Alméria. At the same time, the Spanish Inquisition was developing to identify those who pretended to be Christians. 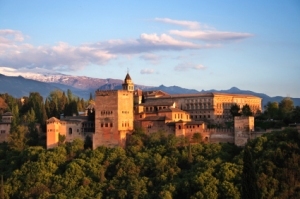 A final push over a period of about 10 years defeated the Moors, who eventually relinquished Granada without a fight in 1492, not that long after the completion of the magnificent Alhambra. The lack fighting left much of Moorish Granada intact, with much remaining today. Large numbers of Moors became Christians (and were known as Moriscos), and settled south of the Sierra Nevada and Granada, the area now known as the Alpujarras, giving it that different flavour it still has.